"Men have dreamed of liberating machines. But there are no machines of freedom, by definition." Summary: The end of the world is coming. And they're doing everything in their power to stop it. Pairing: On the gen/MSR border, with mentions of slash pairings. Warnings: None for major triggers, but includes some descriptions of violence (in a R-rated movie kind of way). There are also people under the age of 15 in this story; be forewarned. Timeline/Spoilers: Post-IWTB, seasons 8 & 9 compatible; exists in my post-IWTB universe, which also includes Whiteboard, The Keeping of Secrets, and Five Times Mosley Drummy Wishes He Never Met Fox Mulder, but not necessary to have read those first. Amal says, "I want to thank idella, my trusty beta, for falling as in love with this story as I did over the past four months, for helping me keep it on track, and for convincing me Consortium is a proper noun; Aloysia Virgata, who did an late-stage second reading that was very helpful, and also for permanently changing the way I think of the word "swipe" in the context of the X-Files; and for sixpences and scullyseviltwin, for helping to make up for my lack of knowledge about sports with bats in them. Also Scooly, to whom I have proposed marriage no fewer than four times over the course of this collaboration." Scooly would just like to say that this was the coolest fandom project she has taken part in so far. There are three ways to read Machines of Freedom. First, it can be downloaded as a PDF, with both text and illustrations. To do so, click on the image below. Second, if you've got a slow connection and want to minimize bandwidth, etc, you can download Amal's text as an RTF file here, and check out Scooly's illustrations separately, here. 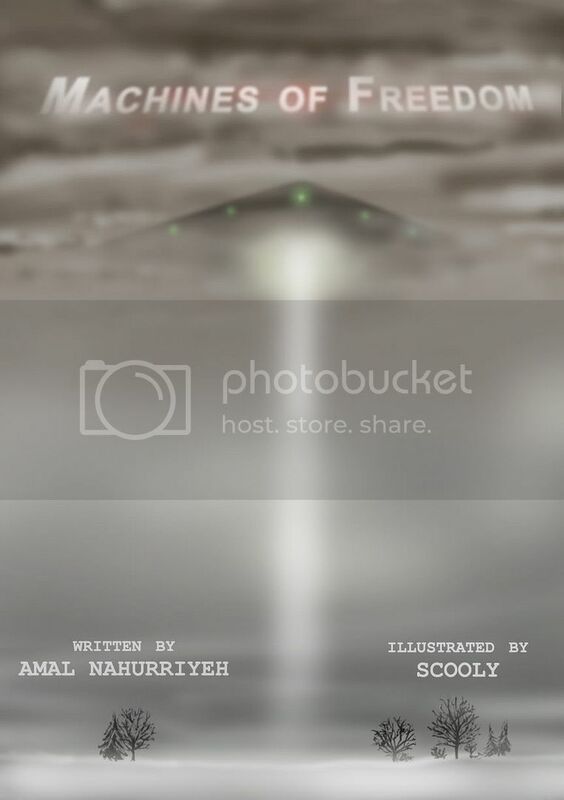 Finally, the text is posted as as 12 separate posts on Amal's Livejournal, with thumbnails of and links to Scooly's illustrations. You are super speedy, lol. Hope you like!